Mercer County, N.J. — A mother who was violently separated from her toddler son during an arrest Friday at a Brooklyn social services office has resolved an unrelated case against her in New Jersey, according to the public defender's office representing her. Jazmine Headley, 23, was released from Rikers Island jail in New York City Tuesday night, hours after the Brooklyn district attorney dropped charges against her related to the Friday incident at a city Human Resources Administration office that drew national outrage. Officers can be seen in a viral video yanking her one-month-old son Damone from her arms as she screams that they are hurting the boy. "I'm just so grateful to everyone and I'm just happy to be free and I just need to see my boy," Headley said following her release. 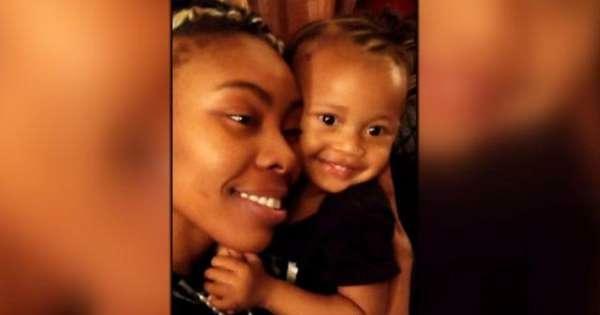 Family said Headley had been waiting for four hours to renew daycare service when a security guard approached her because, with no chairs in the crowded office, she was sitting on the floor. HRA peace officers said the woman refused to leave when they asked her to, so they called police. The NYPD responded, and the woman ended up lying face-up on the floor during a tug of war over the child. At one point, an officer can be seen on the video pulling her stun gun and pointing it at people in the angry crowd. In dropping charges of obstructing governmental administration, resisting arrest, endangering the welfare of a child and trespassing on Tuesday, Brooklyn District Attorney Eric Gonzalez said he was "horrified by the violence depicted in the video." His office previously said that they hadn't requested bail on the charges and that Headley was being held over the weekend on unrelated credit card fraud charges out of Mercer County, New Jersey. Headley appeared in court there Wednesday amid calls for Mercer County Prosecutor Angelo Onofri to drop those charges, as well. According to the Brooklyn Defender's Service, Headley was issued a pre-trial intervention that will result in the charges against her being dismissed in six to 36 months. She was ordered to pay a $1,000 fine and complete community service in the New Jersey case, reports CBS New York. "Jazmine is satisfied with this outcome and gratified the case is resolved and behind her," Brooklyn Defender Services said in a statement. The office has questioned "why police were ever involved." "In our experience, people are often treated abysmally when seeking support from many of the city bureaucracies that are supposed to be helping them," Lisa Schreibersdorf, executive director of Brooklyn Defender Services, said in a statement. Headley's family told the station the ordeal and the use of force were unnecessary. "There was no reason for NYPD to tug and pull like the way they did with him — he was rag-doll basically. And she was really trying to protect him, and you heard him screaming," the child's grandmother, Jacqueline Jenkins, who cared for the boy while her daughter was in jail, told CBS New York. Activists and city officials have decried the arrest. "Being poor is not a crime," said Democrat Letitia James, the city's public advocate and the state's attorney general-elect, in a statement. "No mother should have to experience the trauma and humiliation we all witnessed in this video." The Brooklyn district attorney's office said it was independently investigating and "reviewing all available videos and interviewing witnesses with the intention of reaching a swift decision." NYPD chief James O'Neill called the video "disturbing" and said the department is "looking at all available video to determine why certain decisions were made." Department of Social Services Commissioner Steven Banks said in a statement Monday he was "deeply troubled" by the incident, saying city social services offices should be "safe havens for New Yorkers needing to access benefits to improve their lives." He said he would implement re-training on de-escalation for staff, security guards and peace officers.